When we first learned that architect David Benjamin and his firm, The Living, were planning to build towers out of self-assembling, mushroom-based materials at MoMA PS1, we weren't quite sure what to expect. Now the organic structures, which won the museum's Young Architects Program design competition this year, are nearly complete, and we recently got to sneak a peek. 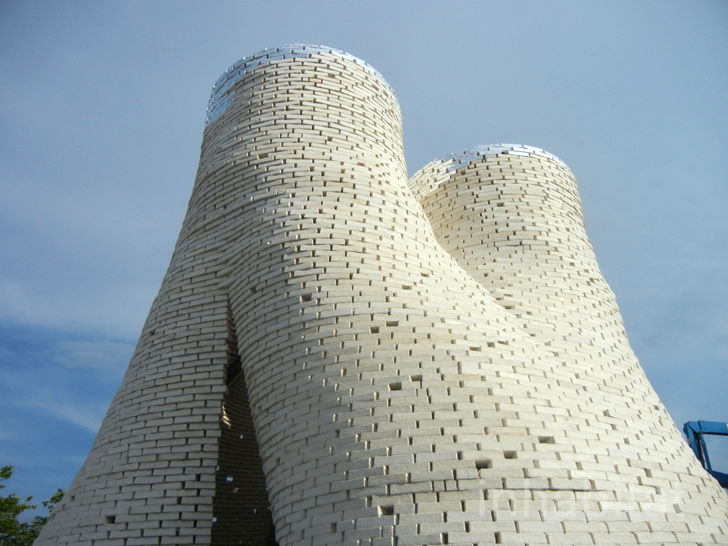 Formed out of bricks grown by NY-based biomaterials company Ecovative, the temporary Hy-Fi tower will be made of 100% organic, compostable material that will be returned to the earth once the pavilion is disassembled. The most fascinating thing about The Living’s Hy-Fi tower is the fact that it was made using a relatively new paradigm in construction based on biological technologies. Rather than mixing concrete or manufacturing bricks, the materials that make up the Hy-Fi pavilion are 100% organic, and are created by adding mycelium (a mushroom root material) to low-value corn crop waste collected from farmers. The mixture is then poured into brick-shaped molds and then self-assembles over the course of a few days. The resulting bio-bricks are made using almost no energy or carbon emissions, and can be composted at the end of their life cycle. On the day we visited MoMA PS1, workers were in the process of stacking the bricks atop one another to form the tower, which will provide shelter and shade for those visiting the museum courtyard during its summer Warm-Up concert series. The Living’s Hy-Fi tower is set to open to the public on June 27th and will be on display throughout the summer. For an idea of what the completed pavilion will look like, click here. Wait what? what holds this together? what keeps this from dissolving in the rain? or shooting out mold spores? I like the idea of growing buildings and building material, but links to the science, please. The installation opens to the public tomorrow. The mushroom tower can now be seen poking out of the museum courtyard. The most fascinating thing about The Living's Hy-Fi tower is the fact that it was made using a relatively new paradigm in construction based on biological technologies. Rather than mixing concrete or manufacturing bricks, the materials that make up the Hy-Fi pavilion are 100% organic, and are created by adding mycelium (a mushroom root material) to low-value corn crop waste collected from farmers. The mixture is then poured into brick-shaped molds and then self-assembles over the course of a few days. The resulting bio-bricks are made using almost no energy or carbon emissions, and can be composted at the end of their life cycle. On the day we visited MoMA PS1, workers were in the process of stacking the bricks atop one another to form the tower, which will provide shelter and shade for those visiting the museum courtyard during its summer Warm-Up concert series. The Living's Hy-Fi tower is set to open on June 26th and will be on display throughout the summer. For an idea of what the completed pavilion will look like, click here. The most fascinating thing about The Living's Hy-Fi tower is the fact that it was made using a relatively new paradigm in construction based on biological technologies. Rather than mixing concrete or manufacturing bricks, the materials that make up the Hy-Fi pavilion are 100% organic, and are created by adding mycelium (a mushroom root material) to low-value corn crop waste collected from farmers. The mixture is then poured into brick-shaped molds and then self-assembles over the course of a few days.